At this point, we needed another film adaptation of the Spider-Man story about as much as we needed a movie that showed the secret stripper origin of Channing Tatum. Alas, this summer we somehow ended up with both. The story is this: Peter Parker (played by Andrew Garfield, whose seems to think that he was actually rebooting Sleeper, since his entire performance here is a tribute to early 70’s Woody Allen) is a really good-looking white kid from a middle class family who happens to be the second best science student at a high school that actually has science in its name. And so he gets crowned president of the school, and spends the rest of the film being carryed around on the backs of his fellow pupils. Oh wait, no. He actually gets picked on by the other kids, which is a little like Noam Chomsky being teased at an Occupy Wall Street Rally for being a little too far to the left . That joke was originally a sports metaphor, but then I realized that no one would believe that I knew anything about LeBron James. Which is true. But I digress. Parker lives with Martin Sheen and Sally Field, who have been taking care of him ever since his family abandoned him for a plot device to be named later. He happens to find some formulas (forumulae? Forumulets?) left by his dad, which leads him to look up his famous scientist father on Google for the first time ever. Or was it Bing? Or Yelp. Maybe ChristianMingle. One of those. So he tracks down his father’s science buddy, gets bitten by a irradiated spider, and then proceeds to gain spider powers. There’s also a talking lizard, and a love interest that’s actually somewhat believable, and Uncle Ben dies. Or was it Uncle Ben dies ? Damn spoiler buttons. The relationship between Peter Parker & Gwen Stacey. I put this first, as it’s the best part of the movie, and the strongest case Sony (and Webb) have for convincing me that this project needed to exist. Emma Stone & Andrew Garfield have a sexual charisma that is not only rare for this type of film, but is actually so palpable that one finds himself hoping that Sony realizes these two should have been remaking 9 1/2 Weeks instead. In every scene they’re in, they look like they can’t wait for the camera to turn off so that they can screw like bunnies. Emma Stone as Gwen Stacy, 5 minutes before making Peter Parker a man in the Midtown High bathrooms. Secondly…Umm…I just realized that was the only thing I really liked about the movie. It’s not that there is anything “wrong” about this piece. It’s fine, really. But if you are going to “reboot” a franchise in which the last film only hit theatres 5 years ago, you better have a pretty great reason for doing so. Sony has about 750,000,000 great reasons for doing so, but none of them matter very much to me. 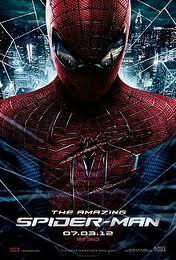 And it’s not as if I have fond memories of Sam Raimi’s bombastic trilogy either. There was plenty of fromage in all 3 instalments (though slightly less in the second, to be sure), with the last one being one of the worst superhero films ever made. There’s less that’s “wrong” here, and I think a strong case could be argued that the tighter dialogue, and stronger cast, definitely made this a slightly more accessible offering than Raimi’s films. But there’s nothing here that screams out “I NEEDED TO BE MADE” here, and nothing that wouldn’t have fit in (with some tweaking, to be sure) as the fourth film in an existing franchise. It’s a slightly fresher take on the origin, but not so fresh as to convince me that Webb’s vision is so different from Raimi’s (As Nolan’s on Batman was from Burton’s, for example) that this film needed to be made. That really doesn’t matter though. What matters is this: Does this movie stand on its own two legs as a credible adventure movie? The answer is sure. Barely, but sure. As stated, the characters have a depth to them that allows me to forgive the inexcusably bad CG (Seriously. How Sony can justify CG this terrible in 2012 is beyond me. I know Webb is a character guy first, but there’s really no excuse for the poor rendering, and choppy action sequences). And the nice tweaks to the Uncle Ben sub-plot (The only absolutely indispensable part of any Spider-Man origin), as well as the very strong motivations for Peter post spider-bite, make up for the hackneyed “LET”S DESTROY EVERYONE JUST CAUSE ARGH! !” motivations of the villain. Rhys Ifans, Emma Stone, and Martin Sheen are the bedrock of a solid cast, and a decent script and some nice direction from Webb made this a fairly well-rounded summer action movie. It’s just not one you need to see. The action scenes don’t have much action in them, and there’s never any real sense of danger to any of the cast, even for the ones that actually die. In fact, it’s only when this action movie stops pretending to be an action movie, that it works on any level at all. P.S. Peter Parker should not be cool. Ever. This entry was posted in Comic Books, Movies and tagged Comics, Movies, Spider-Man, The Amazing Spider-Man. Bookmark the permalink.